Details for the 2019 British Diesel Motorcycle Rally. 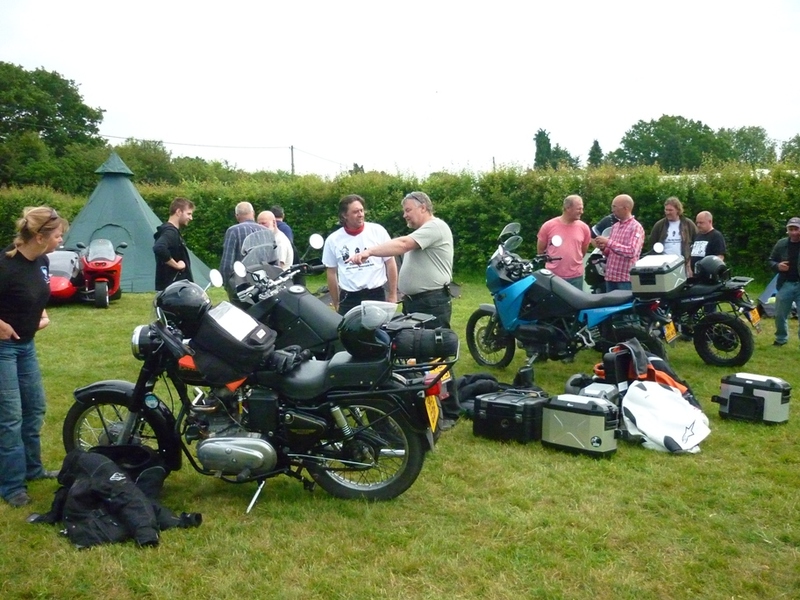 Our 2013 rally saw a record number of Track T800CDi diesel motorcycles in attendance. On this, our 15th year, we extend an open invitation to everyone and anyone owning, manufacturing or selling, an alternatively fueled (or styled) motorcycle. 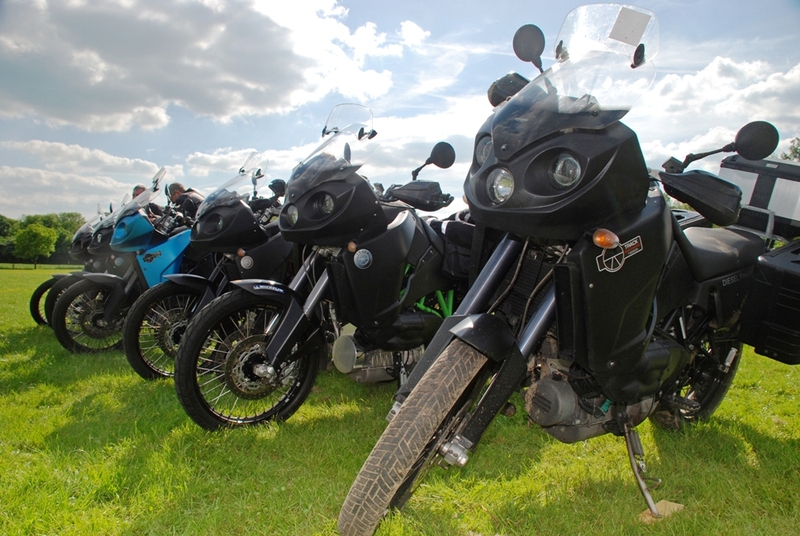 Be it diesel, Bio-diesel, electric, hybrid, steam or whatever, you are invited along to show your motorcycle at the 2019 rally in West Sussex. All machines will be catered for and there are camping power/re-charging points for those that need them. I am pleased to announce that the 2019 British Diesel Motorcycle Rally is all set for the weekend starting Friday 31st May through Saturday 1st of June until Sunday 2nd of June at The Bat and Ball. You are welcome to come on the Thursday but Friday & Saturday are our main days. Rally is over by noon Sunday (at least for our continental guests). If you are coming the view the motorcycles the best time is Saturday afternoon. This year, as last year, we are situated in the Second field. Access is now through the new car park in the first field! Turn left into the gravel car park and then turn right to access field two through the hedgerow entrance. If it's anything like last year we'll be asked to say that if any four wheeled vehicles are NOT support vehicles then they should park in field one, above the car park. This is to keep us and the Pub legal with council regulations for an event featuring Motorcycles. 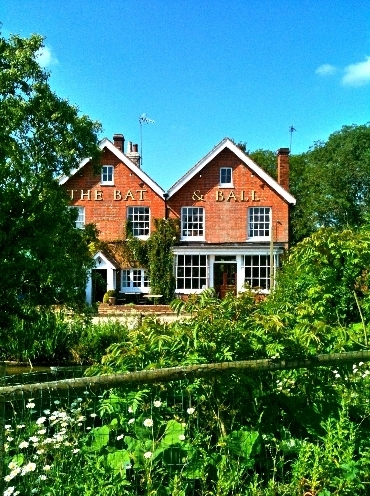 The Bat and Ball is situated at Newpound, Nr Wisborough Green & Billingshurst, West Sussex, RH14 0EH. (on the Road B2133). See below for Maps and site photos. The Pubs Public Wi-Fi password is available from the bar and a signal is receivable close to the pub. This is the only event of its kind in the U.K.and we urge everyone who owns an alternatively fueled motorcycle to at least make an appearance or ideally camp over. It's the only place to swap ideas and see some really interesting & cutting edge motorcycle engineering. This event is FREE and open to all who wish to attend but camping fees apply. Rally camping costs have yet to be finalised (expect in the region of £11 per night) but on the positive side we now have a new toilet & shower block on site, something we have long been asking for. Please pay over the bar for your camping giving your vehicle reg No if requested. As I mentioned above, access to our Rally field (the second field in) is through the car park in the first field. Enter this and turn right & through the hedgerow entrance. There will be a limited number of T shirts for sale at the event. Contact: Please spread the word and if you own a Motorbike you consider to be alternative and plan to come. Obviously, as I said, this is a minority thing and I have no way of telling how many bikes will turn up but I shall be putting the word out and placing a few adverts. Feel free to come and look. You can phone me, Stuart, on 07763 305967 or phone the pub on: 01403 700199. There is no need to pre book camping. Email me here. Please Note: Check this page before attending in case of updates! Paying us organisors on your arrival is probably best. Runout: The aim is for an informal weekend part of which will most probably consist of me doing a run out on Saturday morning. You are welcome to join me! : All the visiting bikes may not be present on site at any one time due to this Saturday runout. Legal stuff: The organisers are not liable for any accident at this venue. Visitors come at their own risk and are warned that machinery can be dangerous! Local Attractions: For those arriving early and those wishing to ride out from the Rally to site-see, I include the following local sites.Motorcycle shops first: Moto Di Marino, Foundry Motorcycles, T. Northeast, P&H Motorcycles, Amberley Working Museum, Arundel Castle, Bluebell Railway, Sussex Past, Weald & Downland Museum, Horsham Homepage, Tangmere Military Aviation Museum, Bury Hill. Or you may wish to visit the local town of Horsham to see it's historic Causway here. Internet Access: Horsham Town Centre has a Public Terminal at its centre in the Carfax close to the bandstand. Typical rally scene from the Bat and Ball camping field. Click this link to read about previous U.K. rallies - we've had quite a few starting back in 2005. Apart from camping, there is a Travelodge locally between Five Oaks and Billingshurst on Stane Street. They can be contacted on 0870 085 0950 or book online through the link. Those travelling from the continent should realise the cost of Bed & Breakfast accomodation is very expensive in this part of the U.K. You have been warned! Directions: Firstly aim for Crawley/Gatwick Airport (M23) in West Sussex from the M25 London Ring road, Then Horsham on the A264. Take the Northern Bypass A264 over Horsham and turn left at the Dorking roundabout onto the A264 Worthing Road. Go straight over roundabout. After .5 km turn off up the dual carragway slip way for BroadBridge Heath (turn right here towards Services) and take the Five Oaks Road left before garage, which is the A264 (A29) (sign posted for Bognor Regis).Go down Broadbridge Heath bypass and turn left. This will get you to the A29 at Five Oaks. Go South on this old Roman Road (Stane Street) until you reach Billingshurst bypass roundabout. Go right and (under bridge) until mini roundabout and take A272. 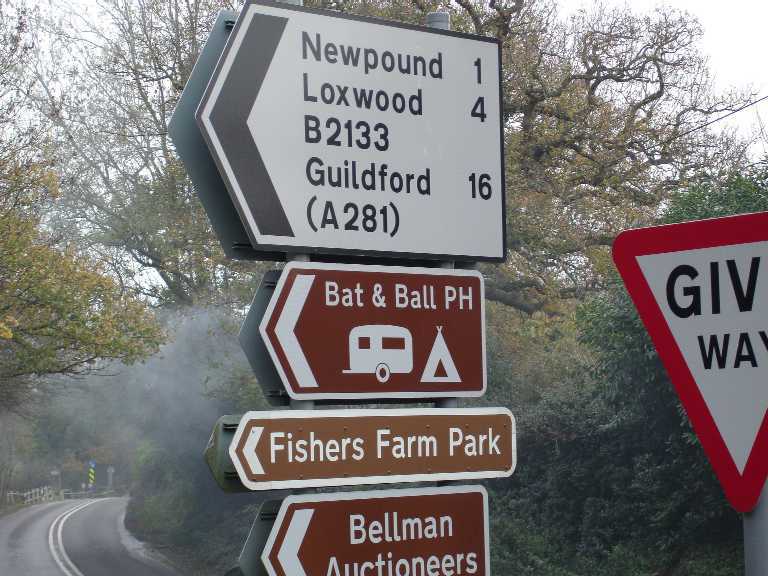 (Note camping sign is for Fishers Farm Park and NOT Bat & Ball but they are close.) Go West until B2133 sign is seen to Newpound. Turn right (north) and the Bat and Ball is up here on the left. If you are coming from the Continent I would advise you travel via the motorway to the M25 and then down to Gatwick as the coast roads are very busy with traffic! Positioning: Could I ask that people bringing motorcycles to position them appropriately so that anyone walking past can view them without falling over tent ropes and such. An information sheet is always a help here (stuck on a stick). In the same vein maybe petrol bikes (and 4 wheel vehicles) could be parked further back out of the way? I'd appreciate it if you could set up your tent without disturbing anyone elses bike. Please be aware that you might be asked a question (or two) by the often curious general public! 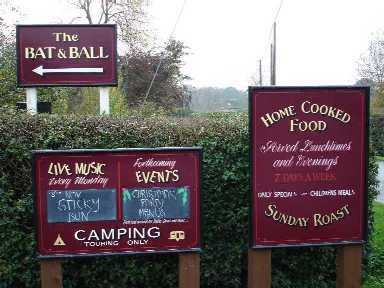 The Wisborough, formerly known as The Bat and Ball. They have hosted other rallies in the past including vintage stationary engine shows. Why not hold your event here? The camping field out front. Main Road away on the left of the picture. The Rally will be in this field! The Pub has a back room and may offer a Barby on the day. Also showers and toilets. Find Gatwick airport, then Horsham (South West of Crawley). Billingshurst is 10 miles South West of Horsham. Better Map here. Do zoom in and out. 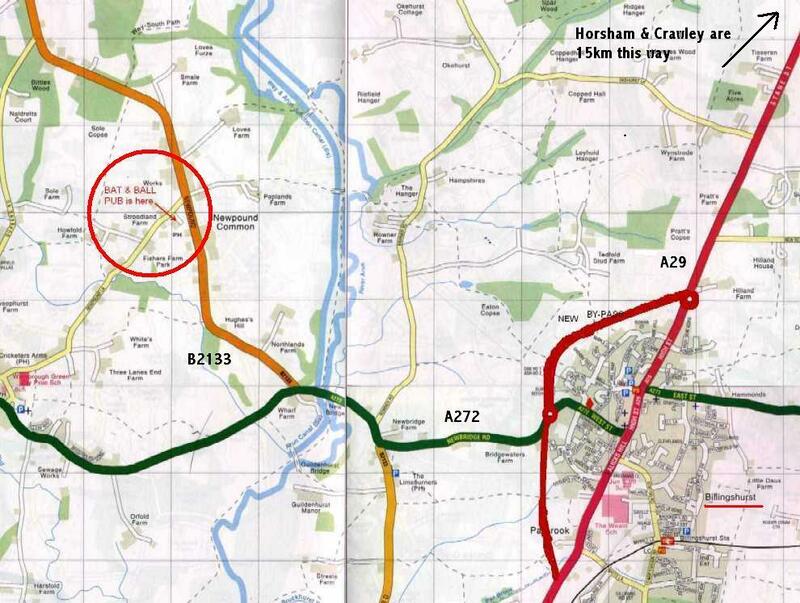 Note: The Wisborough (Bat and Ball) Public House (in RED) is 2 miles West of Billingshurst. If you come from Billingshurst you should cross the bridge in the background and turn right to Newpound as directed. 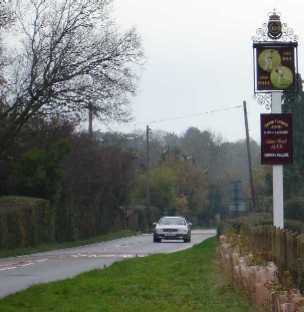 The Pub itself will be seen on the left, set back from the main road. The B2133 that passes the Wisborough (Bat and Ball).